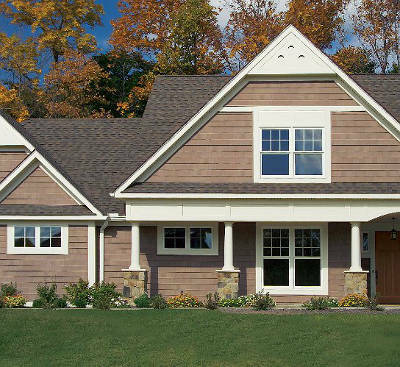 Many homeowners want a warm, inviting look for their home and that’s just what you’ll get with shake siding. With the look of real wood shingles, but the durability and energy efficiency of vinyl, you can’t go wrong with shake siding from Feldco. As we’ve mentioned before, shake siding has the same look as wood shingles. That gives them a warm, inviting look that’s sure to improve your home’s curb appeal. This begs the question, “Why not just get wood shingles?” There are a multitude of reasons. First of all, the price. Wood shingles are vastly more expensive than vinyl shake siding. Not only that, but you’ll be paying for it forever because you’ll need to paint and stain it every few years. Wood also absorbs moisture which causes it to warp and rot. This isn’t a problem you have to deal with when you choose vinyl shakes because it’s resistant to moisture. Not only is your shake siding easier to maintain than wood shingles, but it’s also more durable. There’s a foam backing installed behind your shake panels which makes it impact resistant. That means when your siding is struck by hail or debris blown by heavy wind, the foam will absorb the shock, prevent the siding from denting or cracking. The foam board behind your siding does more than prevent dents and cracks. It also prevents heated and cooled air from escaping your home. That will help make your home more comfortable year round. Plus, you’ll end up saving money on your energy bills. By keeping heated and cooled air in your home, your furnace and air conditioner won’t have to work as hard to reach your desired temperature. They’ll be using less power so your electric and heating bills will decrease. The key to having great shake siding is getting it from the right company in Milwaukee. You want one with years of experience and a great product. You’ll get that from Feldco. We’ve been serving the Midwest for over 40 years and have helped over 350,000 with their home improvement projects. Our shake siding is made from high quality vinyl and can withstand anything Milwaukee throws at it. Not to mention that our siding is installed by factory trained and certified professionals. Your project is in good hands with Feldco. Get a free quote now and get started replacing your home exterior with shake siding today.